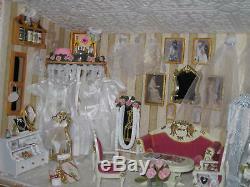 Miniature bridal boutique room scene. All items are securely adhered. Built inside a box that measures approximately 13" high, 9" wide, and 18 long. Room scene is for a table top or shelf and is not wall mounted. Exterior of box is not painted or decorated. Items are 1-12 scale and is a one of a kind original. 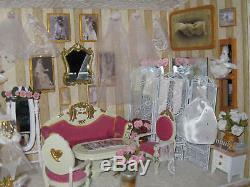 Perfect for a real bridal boutique or for the miniature enthusiast. This is not a toy. Title of this piece is "The Bridal Boutique", and is a second place ribbon winner at the Coconino County Fair in Flagstaff, AZ for 2010. A work of art, "The Bridal Boutique" can be all yours because there is no other like it anywhere. Wedding dresses, lingerie, shoes, handbags, gloves, stockins, and more. A complete and surreal bridal boutique that has been frozen in time, and shrunk!! Don't let this one slip away! 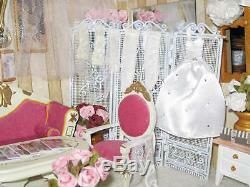 The item "Miniature Bridal Boutique Room Scene Diorama" is in sale since Sunday, September 12, 2010. 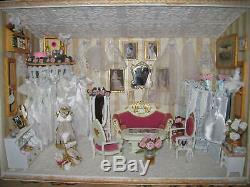 This item is in the category "Dolls & Bears\Dollhouse Miniatures\Other Dollhouse Miniatures". The seller is "vampirecupcake" and is located in Flagstaff, Arizona. This item can be shipped to United States, Canada, United Kingdom, Denmark, Romania, Slovakia, Bulgaria, Czech republic, Finland, Hungary, Latvia, Lithuania, Malta, Estonia, Australia, Greece, Portugal, Cyprus, Slovenia, Japan, China, Sweden, South Korea, Indonesia, Taiwan, South africa, Thailand, Belgium, France, Hong Kong, Ireland, Netherlands, Poland, Spain, Italy, Germany, Austria, Israel, Mexico, New Zealand, Philippines, Singapore, Switzerland, Norway, Saudi arabia, Ukraine, United arab emirates, Qatar, Kuwait, Bahrain, Croatia, Malaysia, Brazil, Chile, Colombia, Costa rica, Panama, Trinidad and tobago, Guatemala, Honduras, Jamaica, Antigua and barbuda, Aruba, Belize, Dominica, Grenada, Saint kitts and nevis, Saint lucia, Montserrat, Turks and caicos islands, Barbados, Bangladesh, Bermuda, Brunei darussalam, Bolivia, Ecuador, Egypt, French guiana, Guernsey, Gibraltar, Guadeloupe, Iceland, Jersey, Jordan, Cambodia, Cayman islands, Liechtenstein, Sri lanka, Luxembourg, Monaco, Macao, Martinique, Maldives, Nicaragua, Oman, Peru, Pakistan, Paraguay, Reunion, Bahamas, Viet nam, Uruguay.